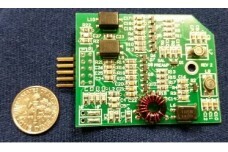 Preamplifier and High Pass Filter (HPF) board for old SAL antenna combiners. By default the HPF is online. It will filter out the Broadcast Band Signals below 1.7 MHz. 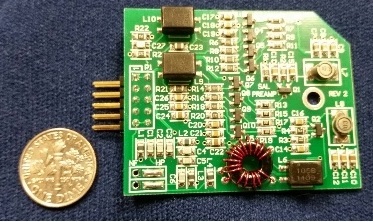 At the lower left corner of the board two strips of solder can be seen connecting the center terminals in the rectangles to the HP side (HIgh Pass Filter). If the reception of signals on the Broadcasting Band is needed, these two solder strips need to be removed and new ones should be placed from the center to the NF (No Filter) side.